The capital of upper Normandy, Rouen is a historic city that is also a center of art and culture. Rouen lies on the Seine River in Normandy, just a couple hours northwest of Paris by car or train. A city with a long history and plenty of medieval architecture, Rouen is also a modern city known for art and culture. Throughout the old city you'll find charming half-timbered houses of all sizes, well-preserved and evoking the city's history. As is common in Normandy, there are also frequent reminders of World War II and its impact on the region. Nearby is the ornate Palais de Justice, with its beautiful Renaissance decor. Because of its located on the banks of the Seine, Rouen is home to both commercial and pleasure craft. Several bridges span the Seine at Rouen and provide interesting walks and views. Rouen is also known for excellent food, made with lots of butter, cheese, and apples. 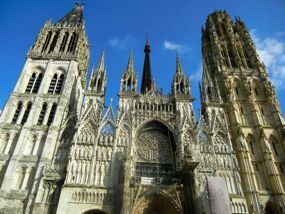 Rouen is a great place to begin your explorations of Normandy. Above, Cathédrale Notre-Dame, Rouen, France. 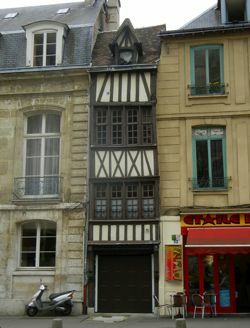 Below, Tiny half-timbered house, Rouen.